Ice9 technology found at ice9technology.com seems like a genuine trading software, but can they be trusted? 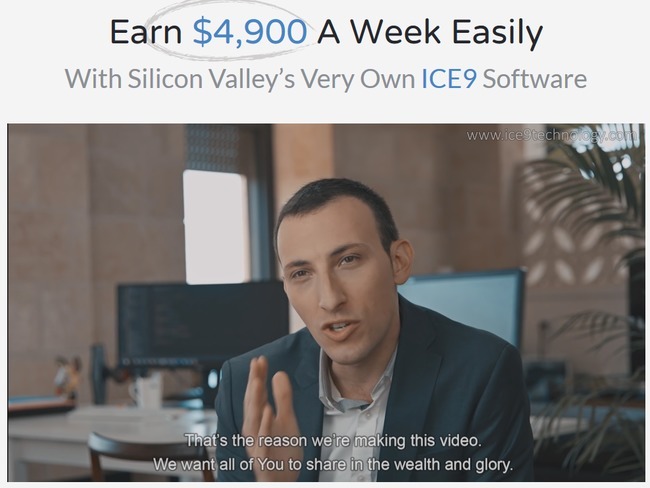 Don’t be fooled, because Ice9 technology is a scam! We’ve uncovered several strong evidence to support our claim, so make sure you read the full review before paying for an obvious scam. Ice9 software is one of the more cleverly disguised binary trading software scams we’ve reviewed thus far. It is professionally presented using the Silicon Valley start-up angle, and it doesn’t include over-the-top fake member testimonials that are easily detected. Still, we’ve had several readers who complained about losing all their deposits with the software, so we decided to investigate their claims. Below is a screenshot of Ice9 technology homepage that we’ve taken after changing our IP address using a VPN service. Notice how it claims a different weekly profit compared to the one shown above. Instead of $4,900 profits a week like what we saw originally, Ice9 was now promising $8,700 weekly profits when we changed to a different IP address. Apparently, the scammers are conducting a split-test to optimize their conversion rate. To put it simply, when we changed our IP address, Ice9 website detected us as a completely different user, even though we have just visited the page moments ago. Thus, it presented a different landing page for us, in this case the page that promised $8,700 weekly profits instead of the page that promised $4,900 as we’ve seen earlier. The scammers are trying out different headlines to see which one captures the most victims (which is what we call the conversion rate). Once they have determined the landing page that results in more sign ups and deposits, they will keep using that page to trick even more internet users. 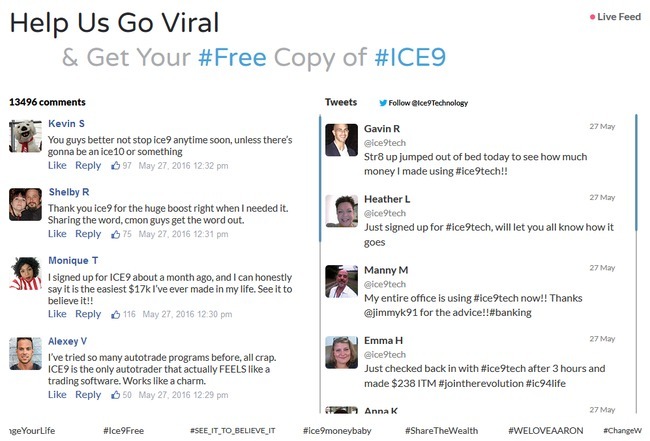 If you scroll down from the sales video, you’ll come across a wall of Facebook and Twitter posts that give praise to Ice9 software. It appears that the scammers behind Ice9 Technology understands the power of social testimonials, so they decided to incorporate fake social approval to gain trust. At first glance, these may seem like genuine posts. But if you look closer, you’ll realize that it’s just a wall of text formatted to look like Facebook and Twitter. Try clicking on any profile or interact with the post by liking or replying to them. You cannot interact with any of the posts, unlike genuine Facebook posts. If you click on the profile names and pictures, they lead to nowhere. It’s because none of these posts are real. If you want to authenticate for yourself, you can try searching for the profiles on Facebook and Twitter, and you’ll find that none of them exists. Have you read the disclaimer for Ice9 scam? You should. As much as the scammers behind Ice9 software wants you to believe it is real, they are bound by legal jurisdiction after all. They have to declare somewhere in the website about the true nature of the scam, or they risk being on the receiving end of legal actions. Therefore, they chose to present it in the most hidden way possible. You won’t find the website disclaimer anywhere in the sales material, because it’s supposed to be hidden from you. You can only find it through a fine print at the bottom of the sales page, where 99% of their victims wouldn’t even realize it’s there. You can verify the authenticity of our claim at this link: ice9technology.com/websiteagreement. It’s clearly stated that the videos displayed on the website are for informational and promotional purposes only. They are produced using actor(s) and demo accounts. The term demo accounts is important as well, because it means that none of the profits shown in the sales material is real. The software wasn’t even used to generate real trades! If you continue reading their disclaimer, you’ll realize that the situation gets even worse if you choose to invest with Ice9. It’s stated clearly in the earnings disclaimer that “YOU MAY, AND SHOULD ASSUME YOU PROBABLY WILL LOSE MONEY TRADING”. They also don’t guarantee your profitability, no matter what they claim in their sales material. Of course, any profits shown in the sales page are fabricated, and used only to entice you into signing up for the scam. Ice9 hides the fact that they were using actors to promote the scam, and they also hide the fact that no actual trades have been generated using the software. How can you trust them with your hard-earned money? 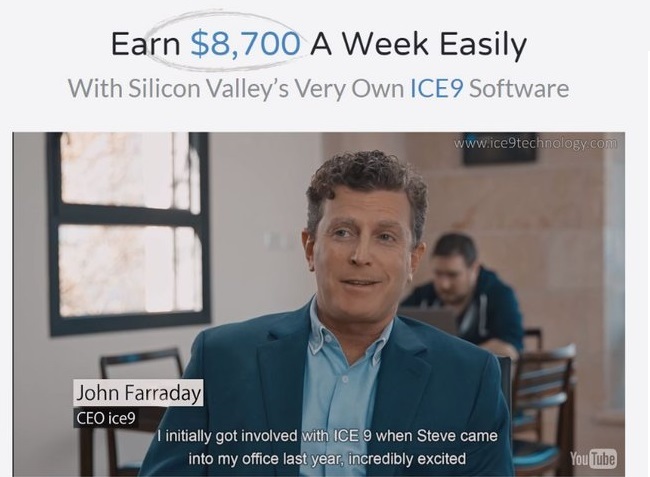 YES, ICE9 IS A SCAM. We strongly advise you to stay away from the scam if you don’t want to lose your hard-earned money. If you decide to sign up, you’ll need to deposit at least $250 to get started (and this is where they make money off you). You’ll be better off spending that $250 deposit for a nice dinner with your family than wasting it on a scam like this. Regal Wealth Scam Review – Please Stay Away!